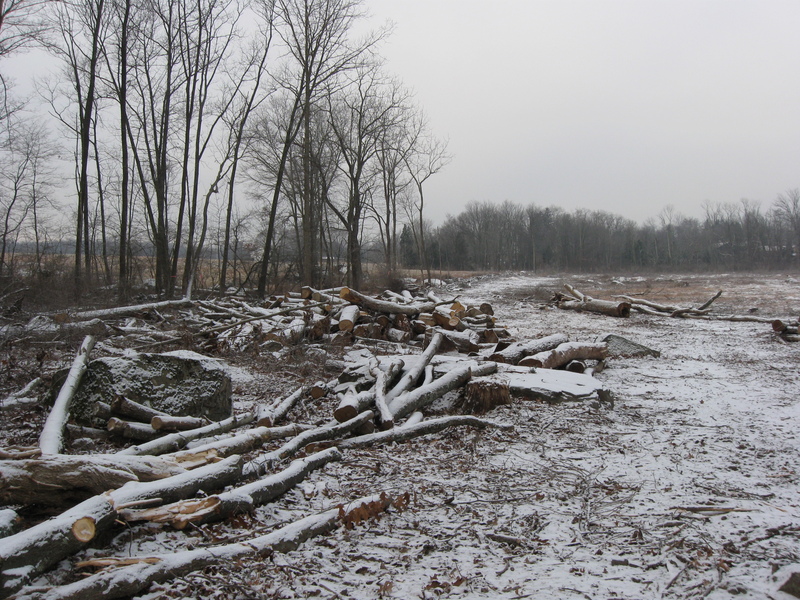 The tree cutting is slowly continuing in the Spangler’s Spring/Spangler’s Meadow area. This view is taken from the A.L. Coble rock. Coble was an infantryman with the 1st North Carolina Regiment. 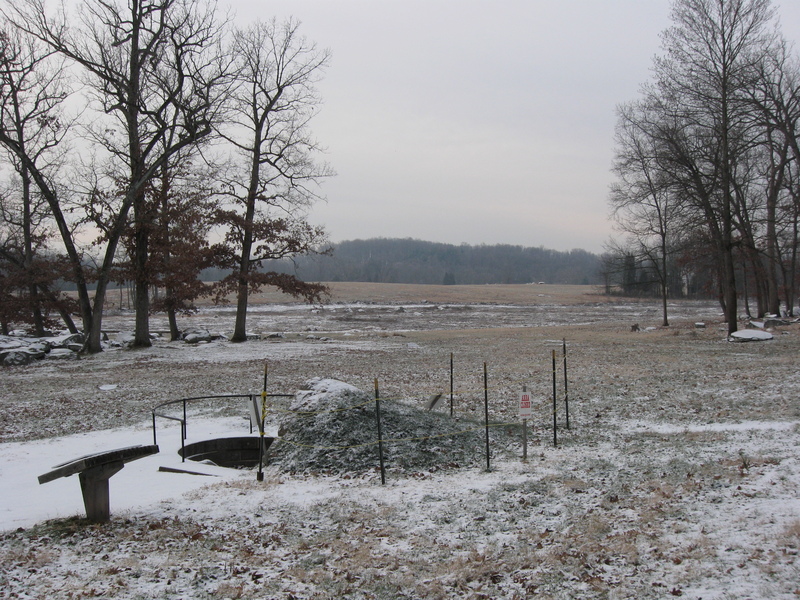 On the morning of July 3, 1863, solidiers from the 27th Indiana charged across the field on the left (Spangler’s Meadow) towards this position. Coble later carved his name on the rock here. The carving is beneath the snow at the bottom of the picture. Powers’ Hill is in the right background. McAllister’s Woods is in the left background. The Indiana State Monument is in the center of the photograph. 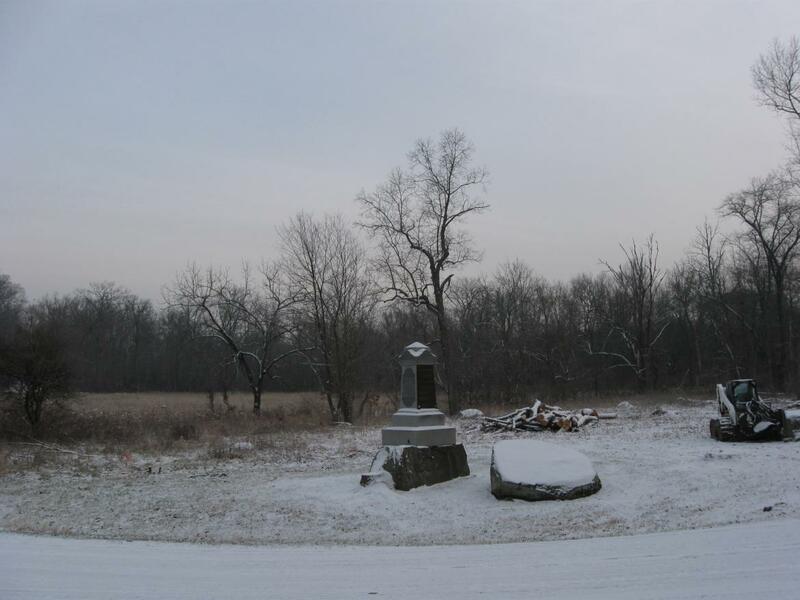 The advance marker for the 27th Indiana (dedicated after September, 1890) is in Spangler’s Meadow. This view was taken facing south at approximately 8:30 AM on Saturday, December 11, 2010. 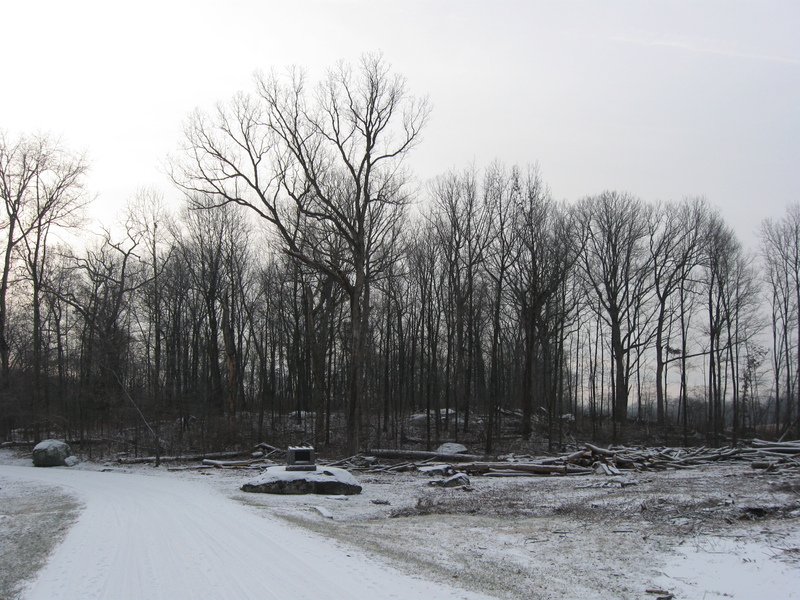 Tree cutting progress is slowly continuing in the Spangler’s Spring area. On the day following our first snow fall (very small amount), we took a walk around the area of Spangler’s Spring and Spangler’s Meadow. We’ll start at the restroom/comfort station which is now very inconspicuously located at the northern end of McAllister’s Field. Power’s Hill is above the restroom. This view was taken facing south at approximately 8:30 AM on Saturday, December 11, 2010. 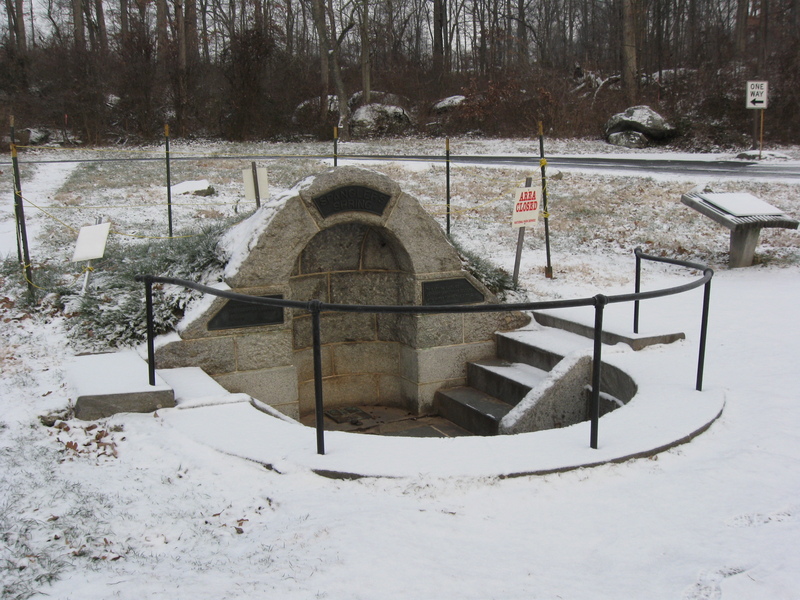 Spangler’s Spring was the location where United States and Confederate States soldiers unexpectedly met each other while in search of water. This view was taken facing northwest at approximately 8:30 AM on Saturday, December 11, 2010. Spangler’s Spring is in the foreground. Powers’ Hill is in the background. 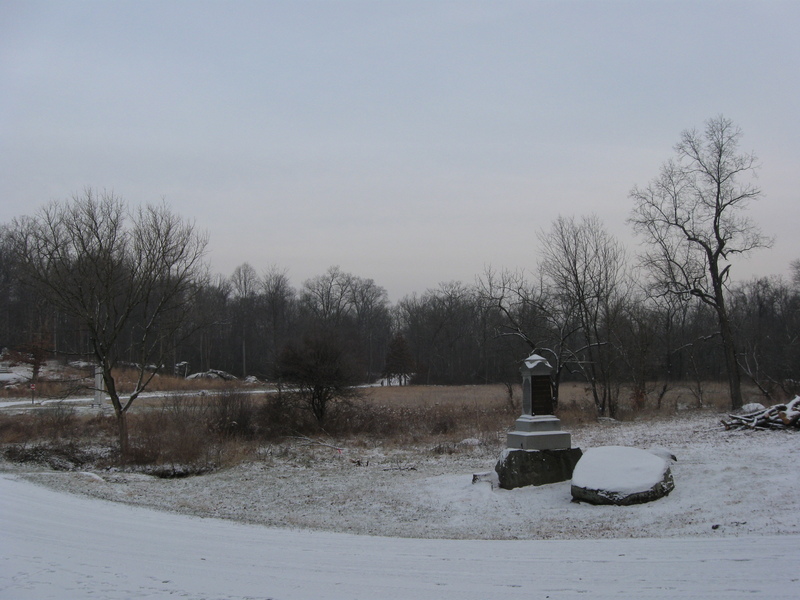 Very early in the morning of July 3, 1863, Union artillery on Powers’ Hill began shelling… This view was taken facing south at approximately 8:30 AM on Saturday, December 11, 2010. …Confederate infantry that occupied lower Culp’s Hill. Spangler’s Spring is in the foreground. This view was taken facing north at approximately 8:30 AM on Saturday, December 11, 2010. 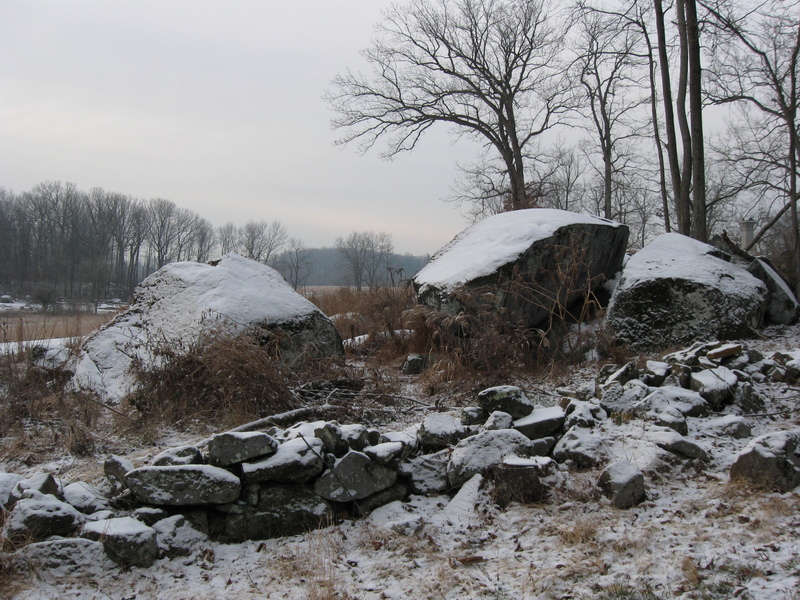 We’ve climbed up a little on lower Culp’s Hill behind a stone wall to which we have in previous posts, and will in this post frequently refer. It separates Culp land (on this side of the wall) from Spangler land. The monument to the 1st Maryland Potomac Home Guard (USA) is to the left of Slocum Avenue. Powers’ Hill is looming in the background. This view was taken facing south at approximately 8:30 AM on Saturday, December 11, 2010. This image was taken from approximately the same position as the previous picture. Spangler’s Meadow is at the bottom of the hill on the left. 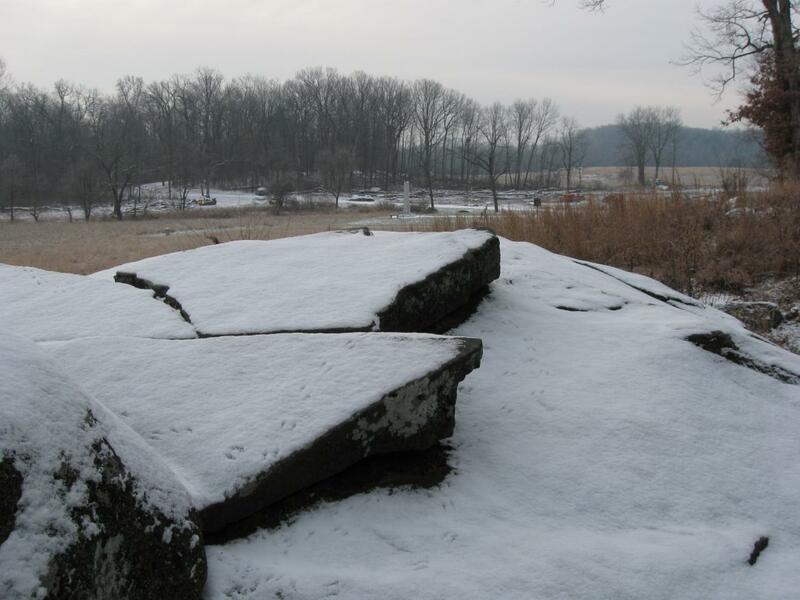 The marker for the 27th Indiana is visible in the meadow. McAllister’s Hill is above Spangler’s Meadow. 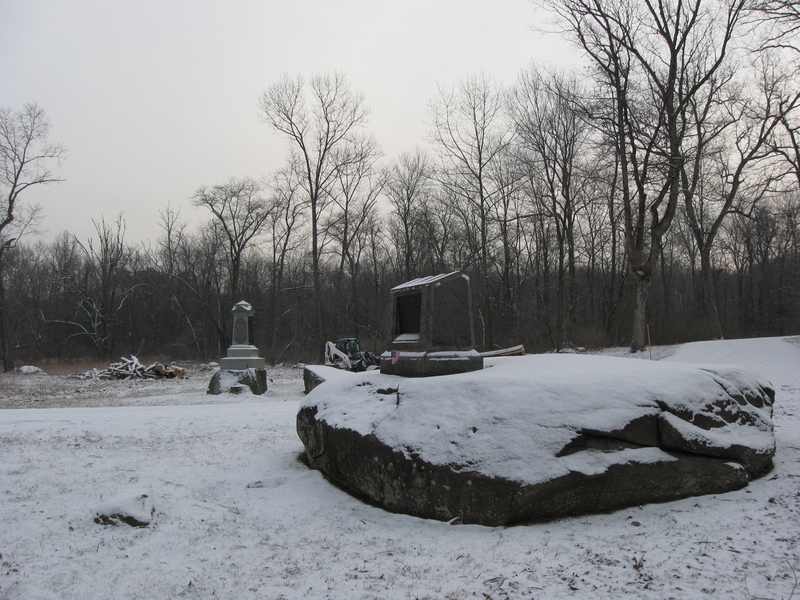 The monument in the center of the picture is to the 107th New York Infantry Regiment. The monument on the right is to the 1st Maryland Potomac Home Guard (USA). The red flags on the left mark the location of trees for the grove that has been replanted, and which doesn’t appear to be doing too well yet. 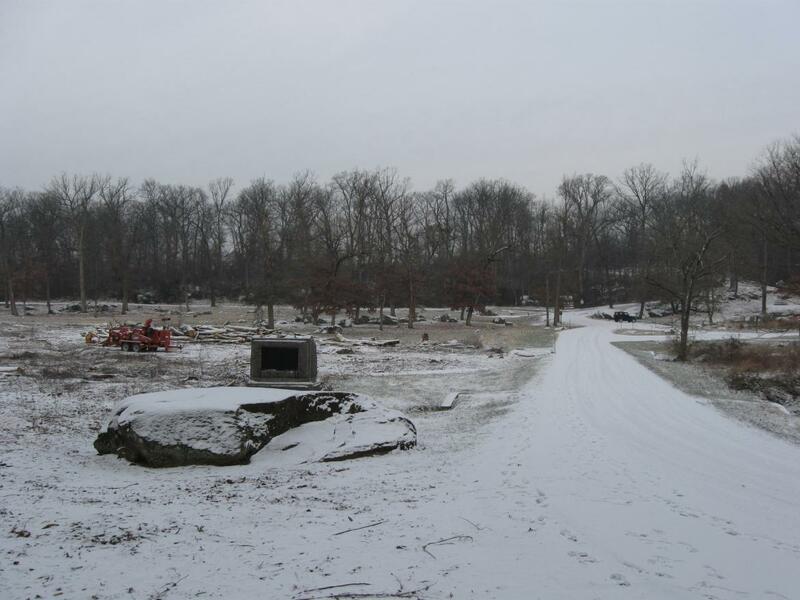 This view was taken facing southeast at approximately 8:30 AM on Saturday, December 11, 2010. We’ve now walked off lower Culp’s Hill towards McAllister’s Field. Powers’ Hill is in the background. This view was taken facing south at approximately 8:30 AM on Saturday, December 11, 2010. The wood chipper/grinder is the red piece of equipment. The white barn in the right background is at the Welcome Traveller location, now used by National Park Service seasonal employees. The building to the left of the white barn is the Nathaniel Lightner House on the Baltimore Pike. This view was taken facing south at approximately 8:30 AM on Saturday, December 11, 2010. We’ll now move down Colgrove Avenue towards McAllister’s Woods. The monument to the 2nd Massachusetts Infantry Regiment is located on the rock. This view was taken facing southeast at approximately 8:30 AM on Saturday, December 11, 2010. From the same position as the previous image, but turning a little more to the right. Powers’ Hill is in the background. McAllister’s Field is mostly the located where one sees the “yellowish” grass. This view was taken facing south at approximately 8:30 AM on Saturday, December 11, 2010. The monument to the 2nd Massachusetts Infantry Regiment, erected in 1879 is the first monument erected that marks a unit’s position during the battle. The 1st Minnesota urn was placed in the National Cemetery in 1867 but doesn’t mark a battle position. The Soldiers Monument in the National Cemetery, erected for all Union soldiers, had its cornerstone laid in 1865, but it wasn’t dedicated until 1869. 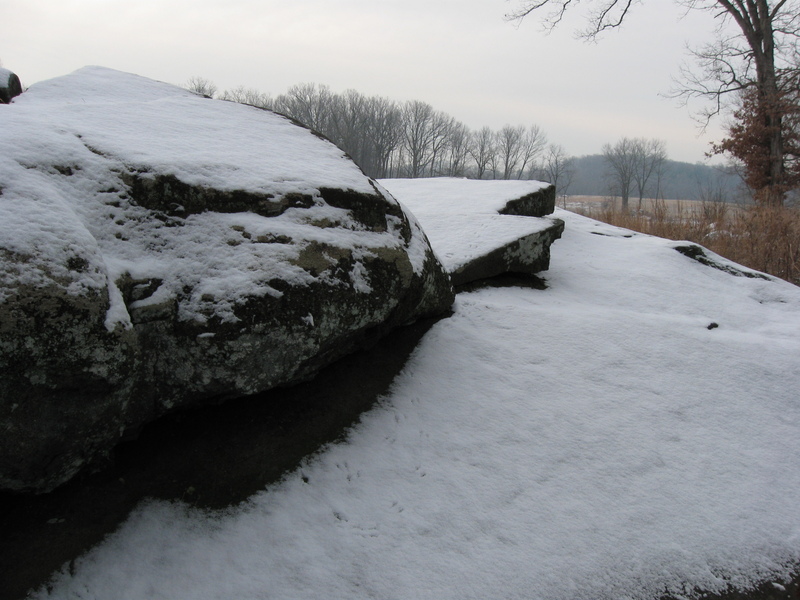 Admirers of Stong Vincent erected a marker for him on Little Round Top in 1878. This view was taken facing southwest at approximately 8:30 AM on Saturday, December 11, 2010. Another view of the 2nd Massachusetts Monument. Across Colgrove Avenue is the monument to the 27th Indiana Infantry. These two regiments charged out of McAllister’s Woods from right to left and across Spangler’s Meadow early in the morning of July 3, 1863. This view was taken facing northeast at approximately 8:30 AM on Saturday, December 11, 2010. 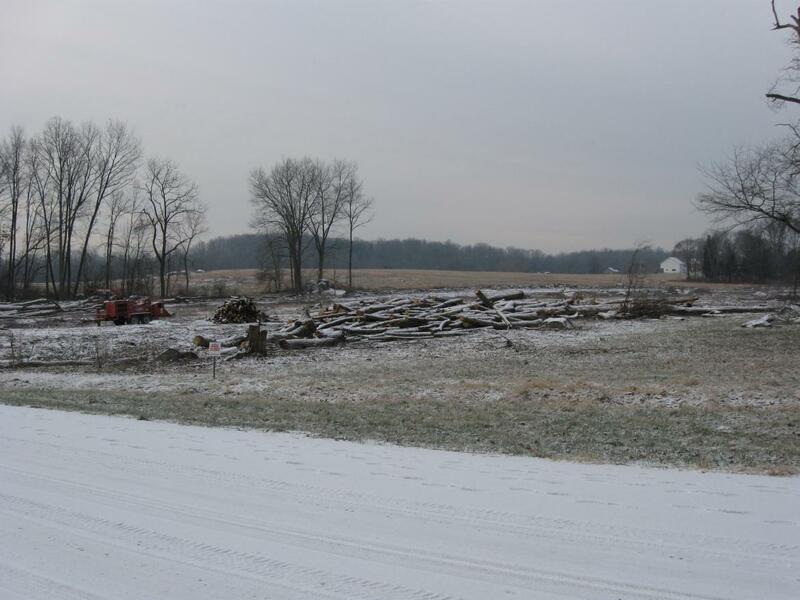 Trees are also being cut down around the 27th Indiana Monument. This view was taken facing northeast at approximately 8:30 AM on Saturday, December 11, 2010. 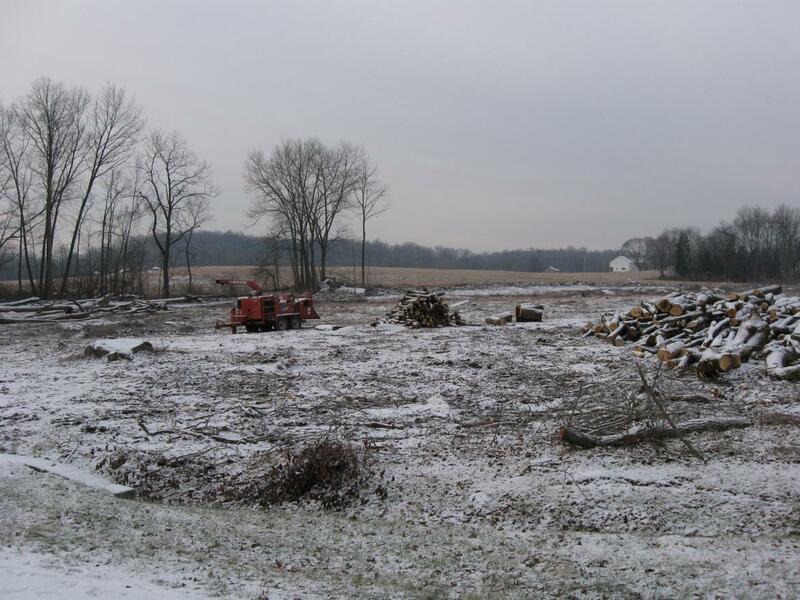 We hope most of these remaining trees will be removed. In the left background is lower Culp’s Hill. Spangler’s Meadow is on the other (north) side of the monument. This view was taken facing north at approximately 8:30 AM on Saturday, December 11, 2010. Back at the 2nd Massachusetts, we are very impressed with the amount of trees that have been removed from the monument’s location to Lower Culp’s Hill, which is the trees in the background, especially the right background. This view was taken facing northwest at approximately 8:30 AM on Saturday, December 11, 2010. 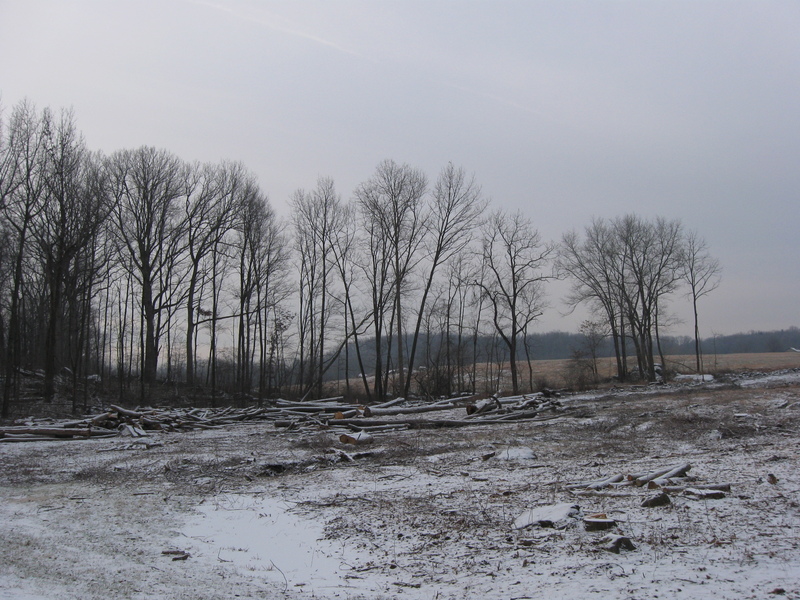 Tree cutting progress is slowly continuing in the Spangler’s Spring area. Just a little progress has been made in making McAllister’s Field visible from Spangler’s Meadow and Spangler’s Meadow visible from McAllister’s Field. 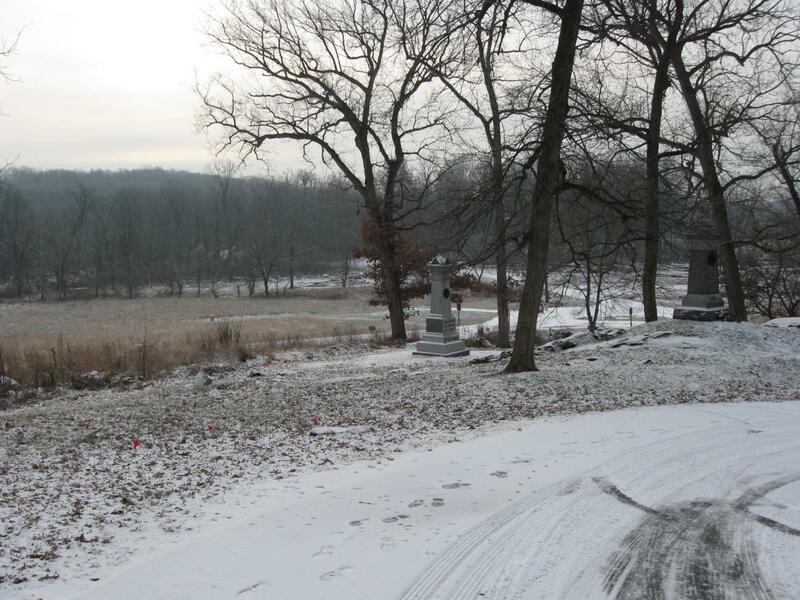 Early on the morning of July 3, 1863, the 2nd Massachusetts charged towards Spangler’s Spring, which is located on the left (west) of Colgrove Avenue, across from the obtrusive blue jeep. This view was taken facing northwest at approximately 8:30 AM on Saturday, December 11, 2010. Before we leave the area of the 2nd Massachusetts Monument, we’ll take a last look at the tree cutting at the edge of McAllister’s Woods. 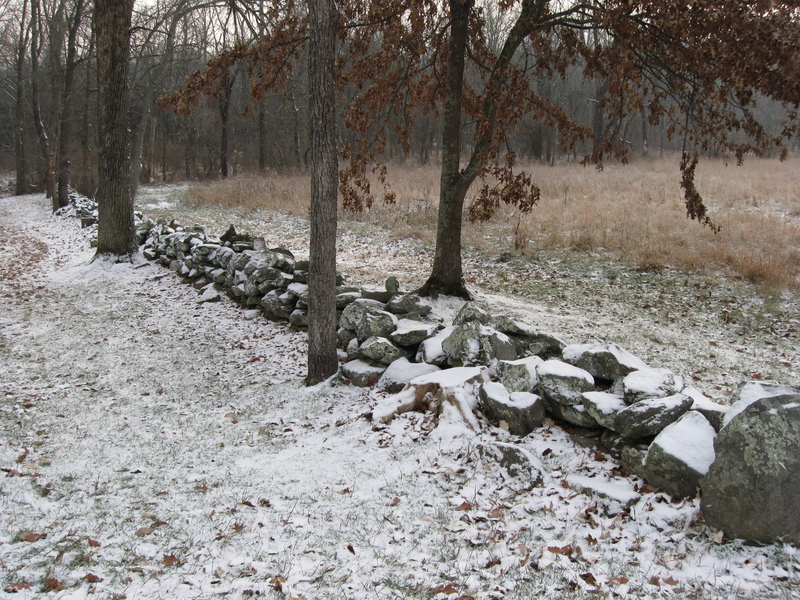 Notice the stone wall in the center background “running away” from the camera position towards some privately held woods. This view was taken facing west at approximately 8:30 AM on Saturday, December 11, 2010. But back to the 27th Indiana Monument. They charged across Spangler’s Meadow from this area. 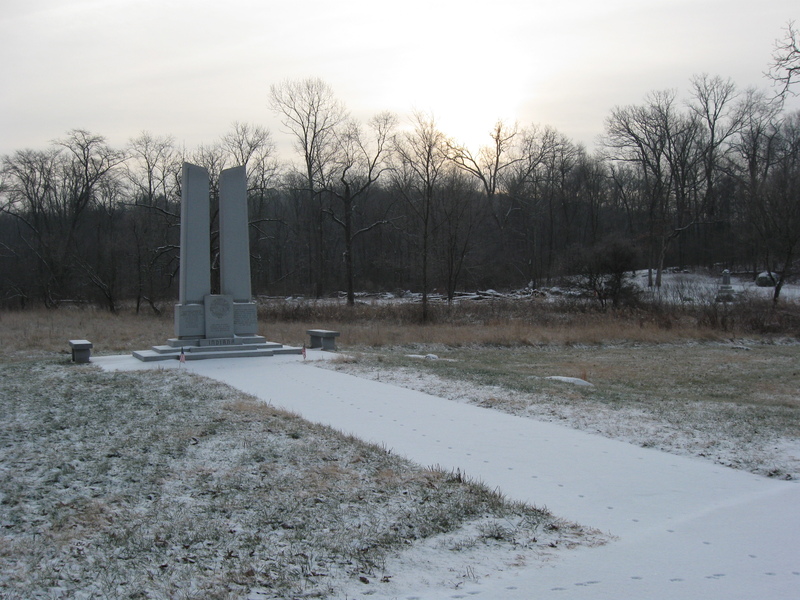 The marker showing their advance is in the field to the front right of the monument. The Indiana State Monument is to the left of the 27th Indiana Monument. We’ll walk to the state monument next. This view was taken facing north at approximately 8:30 AM on Saturday, December 11, 2010. The Indiana State Monument was dedicated in 1971. The monument to the 27th Indiana Regiment is in the right background. This view was taken facing southeast at approximately 8:30 AM on Saturday, December 11, 2010. 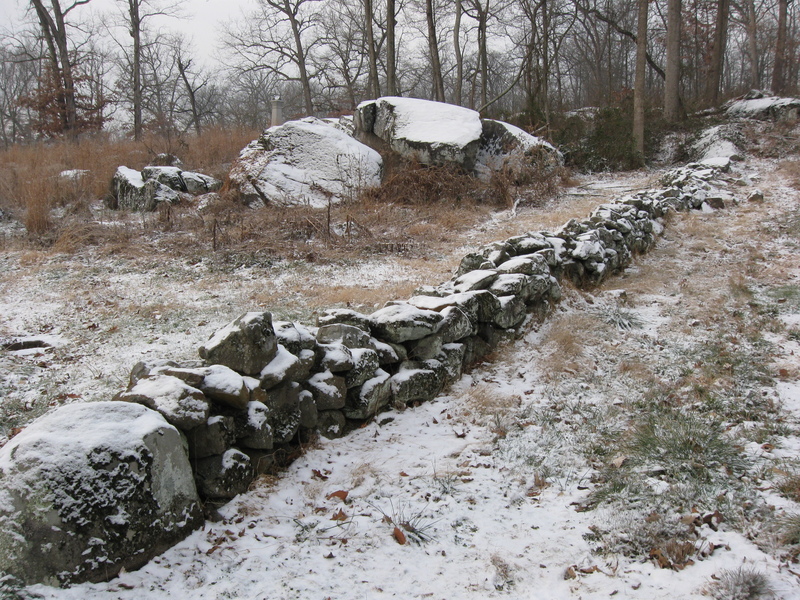 We’ve walked to the northeast side of Spangler’s Meadow to the stone wall that separates Culp property on the left of the wall from Spangler property on the right of the wall. But before we go down here… This view was taken facing southeast at approximately 8:30 AM on Saturday, December 11, 2010. We’re going to walk up Lower Culp’s Hill along the wall. Spangler property now on the left of the wall. Culp property on the right of the wall. 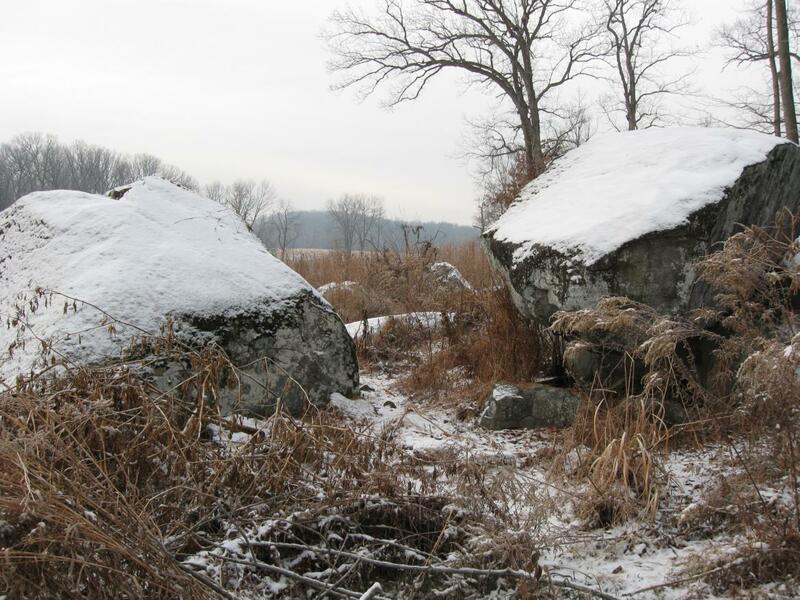 The monument to the 107th New York Infantry Regiment is in the background above the large rocks. This view was taken facing northwest at approximately 8:30 AM on Saturday, December 11, 2010. 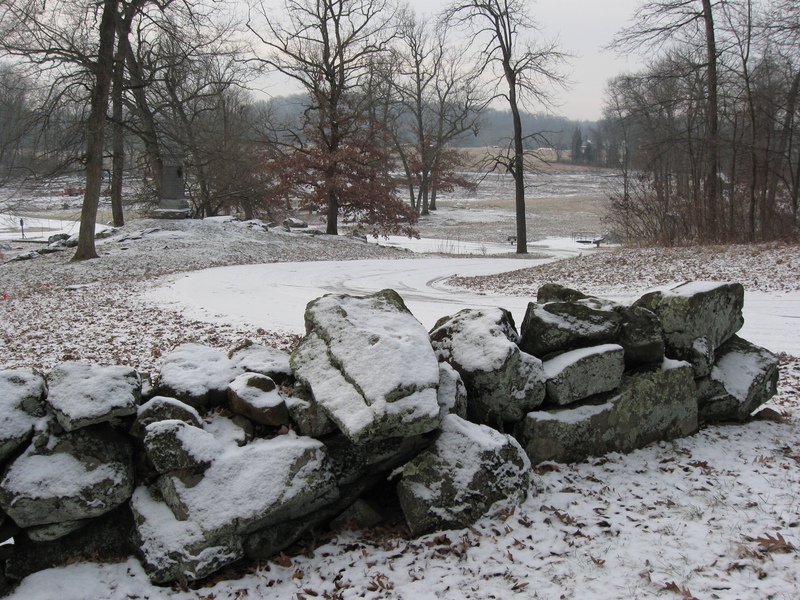 Again, very early in the morning of July 3, 1863, Confederate infantry, probably located behind (this side) of the stone wall and behind these large rocks was shelled by Union artillery on Powers Hill, which is in the background between the large rocks. McAllister’s Woods is in the left background. 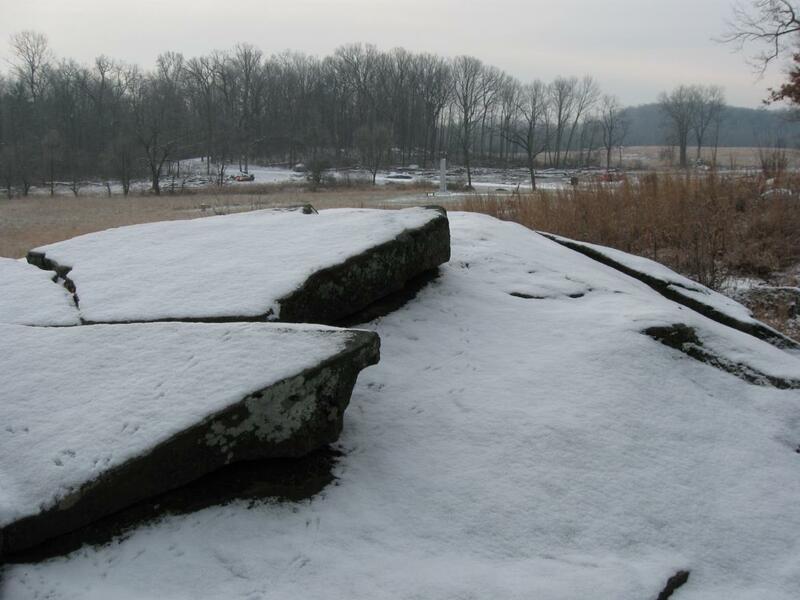 The “Coble Rock” is behind the large rock in the center of this view. This view was taken facing south at approximately 8:30 AM on Saturday, December 11, 2010. We hope that Powers Hill will soon be cleared of its trees so that we can show you the view from there looking back to this position. This view was taken facing south at approximately 8:30 AM on Saturday, December 11, 2010. 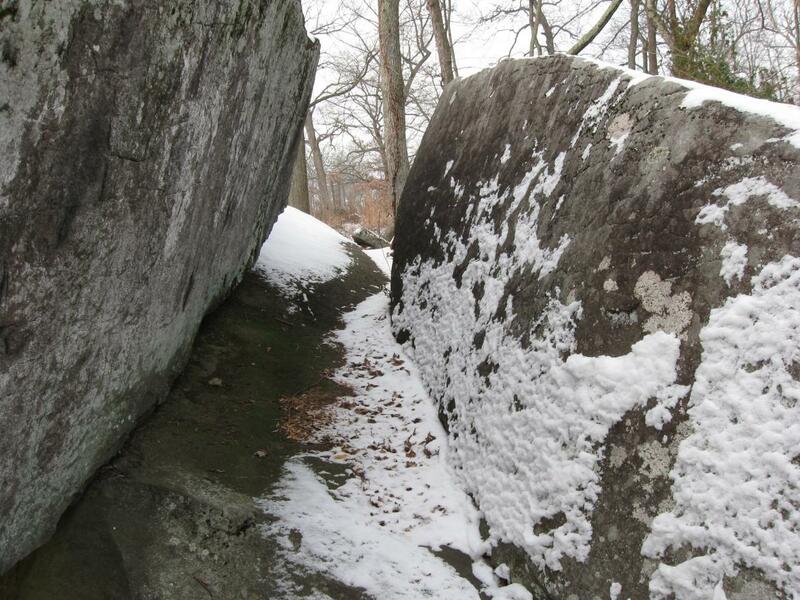 We’ll climb between these rocks to get to the area where the “A.L. Coble” carving is. In fact its under the snow straight ahead as we get into the “open” again. This view was taken facing west at approximately 8:30 AM on Saturday, December 11, 2010. Again, the Coble carving is below the snow at the bottom of the view. Powers’ Hill is in the right background. This view was taken facing south at approximately 8:30 AM on Saturday, December 11, 2010. 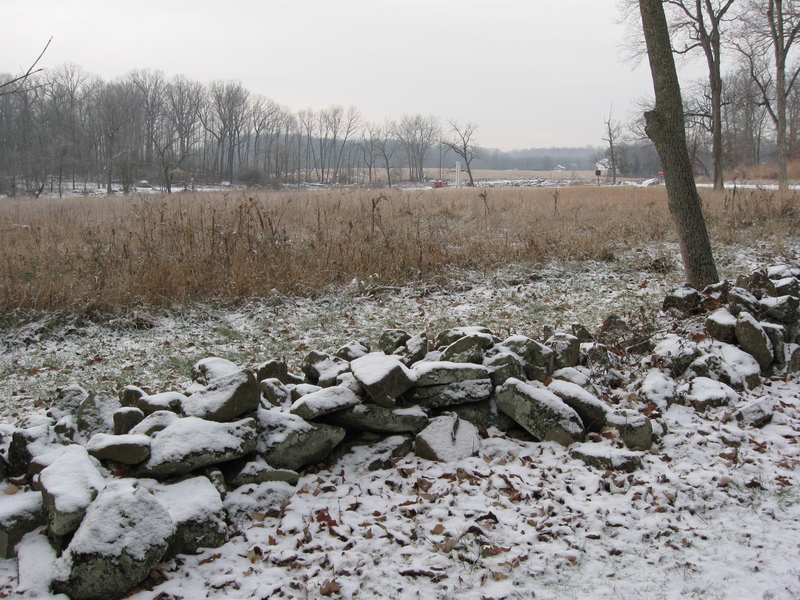 Here’s Coble’s view of Spangler’s Meadow early in the morning of July 3, 1863. We came to the rock this way so that our footprints wouldn’t be in the picture. A little bird beat us here first though. McAllister’s Woods are in the center background. Powers’ Hill is in the right background. This view was taken facing south at approximately 8:30 AM on Saturday, December 11, 2010. 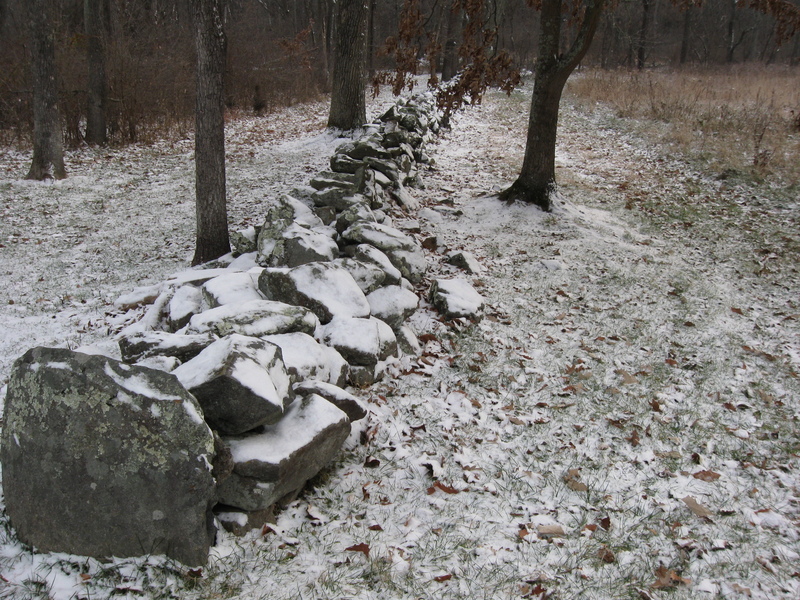 But back to the stone wall on the northeast side of Spangler’s Meadow, which is on the right side of the wall. This view was taken facing southeast at approximately 8:30 AM on Saturday, December 11, 2010. 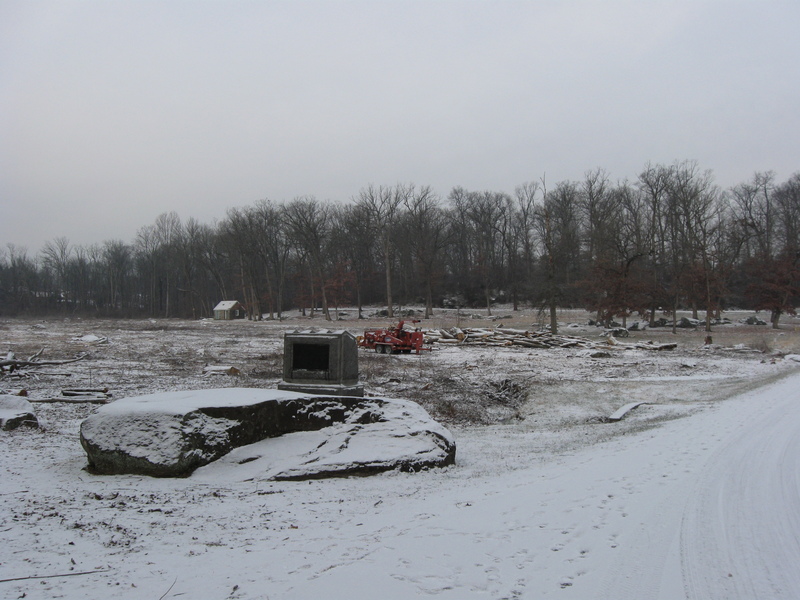 Here is a view showing the progress of the tree cutting from behind this stone wall on the northeast side of Spangler’s Meadow. 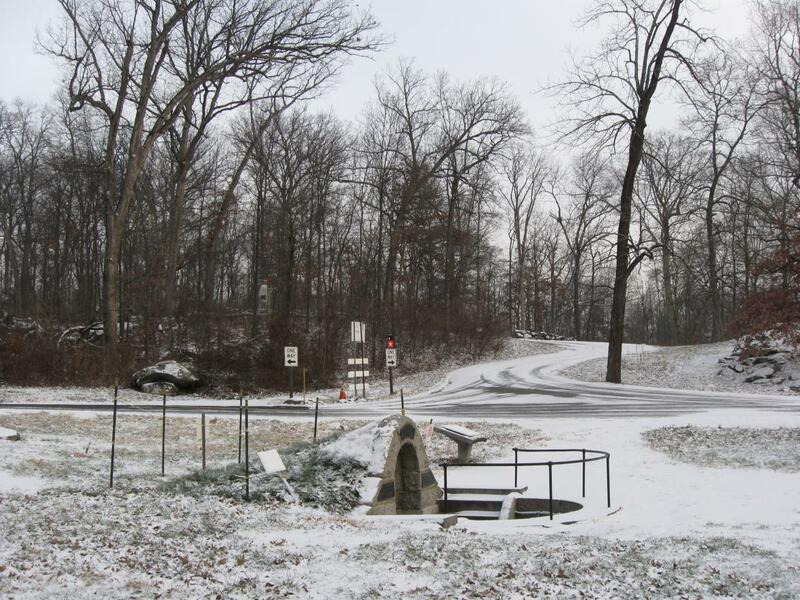 The tall, white/gray Indiana State Monument is clearly visible in the center of this view. 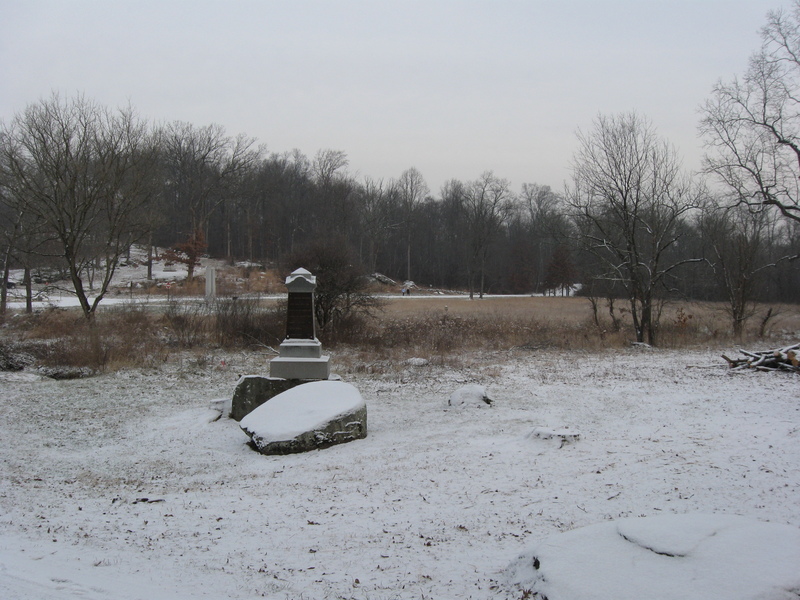 The 27th Indiana Monument is visible in the left background below McAllister’s Woods. The 2nd Massachusetts monument is hidden by the brown bushes/trees. Powers’ Hill is in the center background. 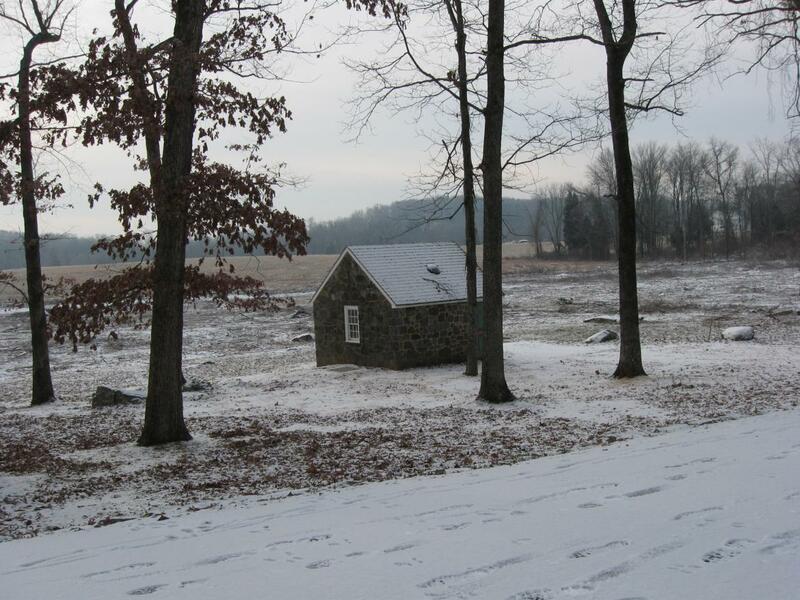 To the right of Powers’ Hill is visible the Nathaniel Lightner House and the white Welcome Traveller Barn, both of which are located along the Baltimore Pike. This view was taken facing southwest at approximately 8:30 AM on Saturday, December 11, 2010. 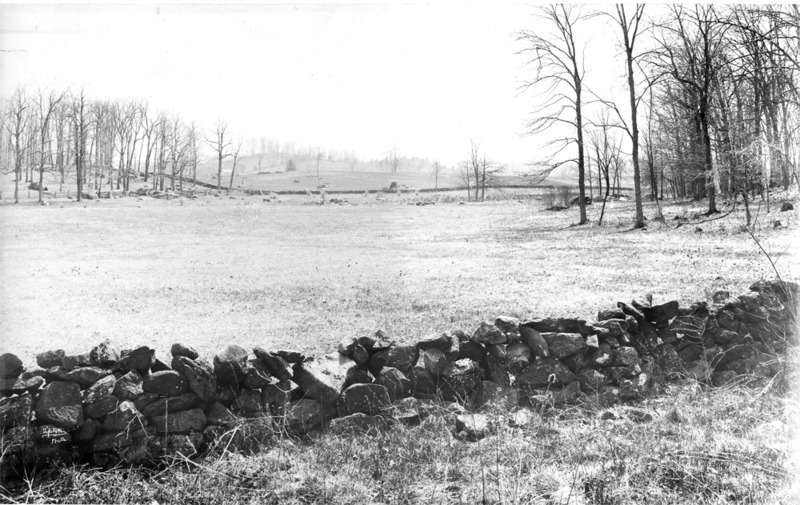 Here is how the Spangler’s Meadow looked in the 1880s. McAllister’s Field and Powers’ Hill are clearly visible in the center background. The monuments to the 27th Indiana (dedicated 1885) and the 2nd Massachusetts (dedicated 1879) are in the left background. These regiments charged across Spangler’s Meadow from left to right on July 3, 1863. 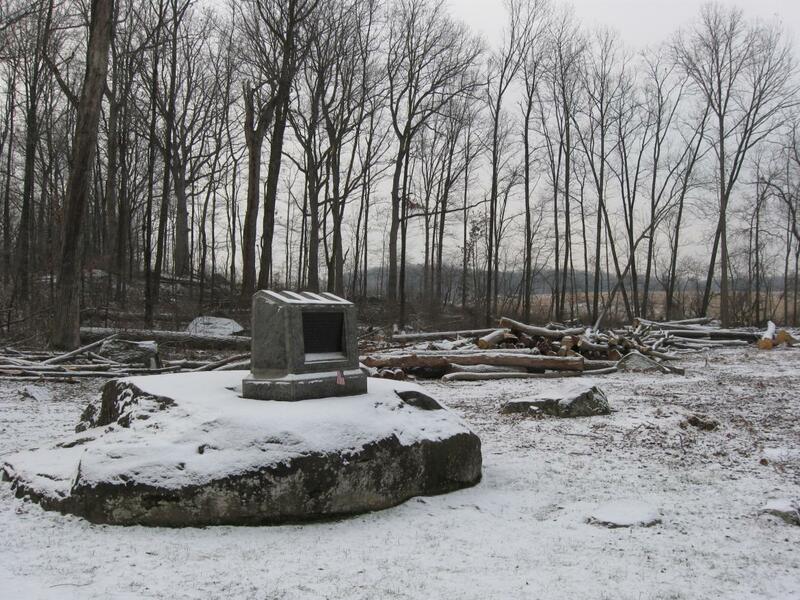 This William Tipton photograph is courtesy of Gettsyburg Licensed Battlefield Guide John Archer. This view was taken facing southwest circa 1885-1890.